We have adapted to being connected and as such using social media to share our lives and experiences. It is however very interesting to see how little people value their privacy and devalue the image that their online persona displays to the rest of the world. It is also relatively common for today’s teenagers to think nothing about posting and sharing their debauched party behaviour with the rest of the world without thinking what a possible employer might make of it all. A recent study has proven that your online presence has a very real effect on the perspectives that is formed about who you are and what values you prescribe to. 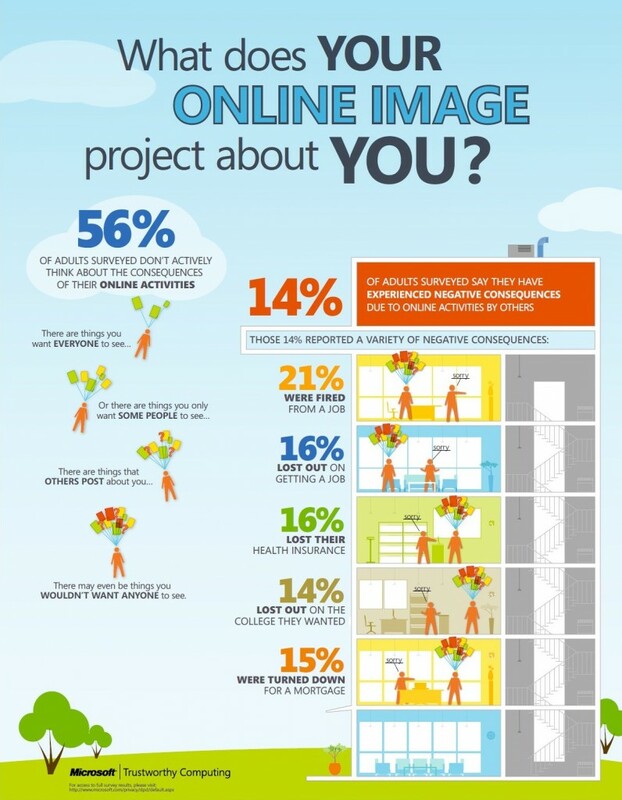 Even 56% of adults surveyed did not think about the consequence of their online behaviour. They also did not think about the fact that they are not the only contributors to their online persona and therefor they need to think and review what is placed online concerning them. Amongst theses respondents 14% reported that they have already had a negative consequence from what is available and published about them online. Where 21% of these respondents were fired from their jobs and 15% were turned down for a mortgage. If this is true about a person have you thought about how much worse an online presence for a company can skew the thinking of a prospective client or investor either positive or negative? This is the age of digital PR where you need to keep your finger on the pulse of what and where your company’s name travel and how clients interact with that name. Social media is the new word of mouth and you have to try and control how you deal with negative feedback. If these figures are true for individuals then it is not too much of a jump to see the impact for a business. How are you safeguarding your company on-line?